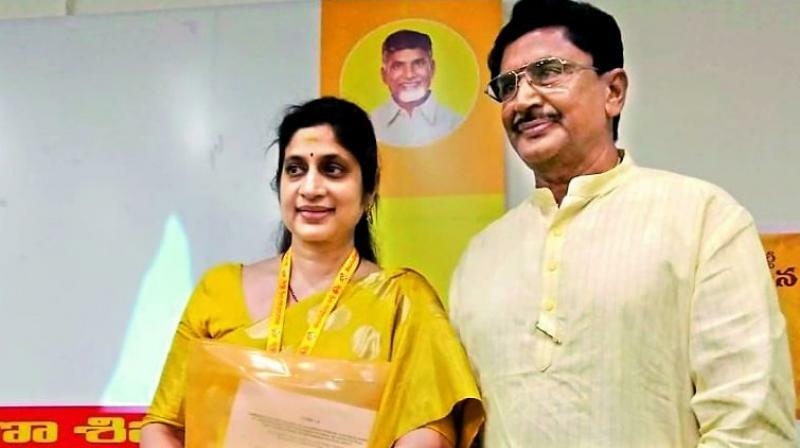 Reclusive by nature and better known as the daughter-in-law of film, political and business personality Maganti Murali Mohan, Roopa Maganti is only now stepping into the limelight, as she contests for the Lok Sabha elections on a TDP ticket from Rajmahendravaram (erstwhile Rajahmundry). Born and brought up in Chennai, Roopa and her family lived in Vijayawada for a brief while but communal riots between two communities — the Kammas and Kapus forced them to return to Chennai. “My father, A.K.V. Prasad made three films in Telugu and was also an agriculturist. However, the Raga Riot as it was known, forced us to move to Chennai. Even though we are Kammas, I remained oblivious about all these communities till I got married and shifted to Hyderabad,” says Roopa. After completing her graduation in Corporate Secretaryship and a Masters Degree in Rural Community Development, Roopa went on to do a PG Diploma in Psychology followed by an opportunity to work as an apprentice in Sri Lanka in a labour organisation. Though a one year project, Roopa went on to work as a Government Consultant in Sri Lanka for the next 13 years. “I worked for Mahendra Raja Babu in Sri Lanka and consider myself to be a half Tamil,” says Roopa, who has managed to keep a very low profile thus far. “Even after marrying my husband Ram Mohan, we remain extremely private people. There is nothing about me in the media, as I have always been a very shy person,” she says. As for her agenda in the region, Roopa explains that she wants to give secure jobs to women while creating eco friendly and sustainable industries.